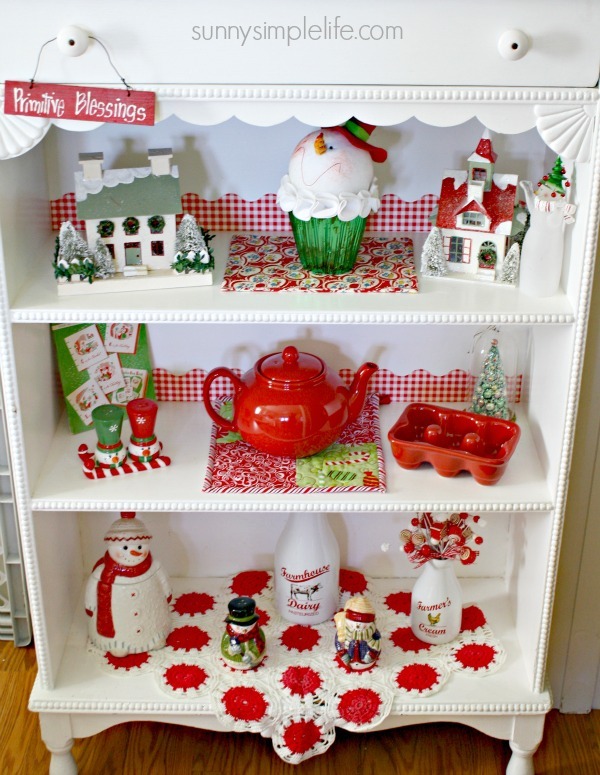 First Christmas tour is part of our Christmas kitchen and this year Christmas decorating ideas in red and white. With our new butter yellow walls, a red and white Christmas was in order. 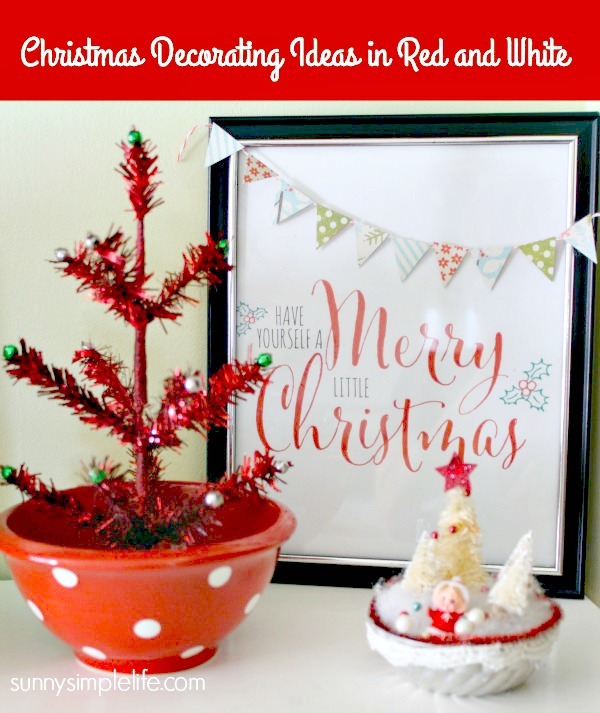 I love red so adding red and white Christmas decorations was easy and we loved the outcome. Of course hubby did most of the tweaking but I was in there too. This was our bottle brush tree year. We just kept picking them up wherever we went. 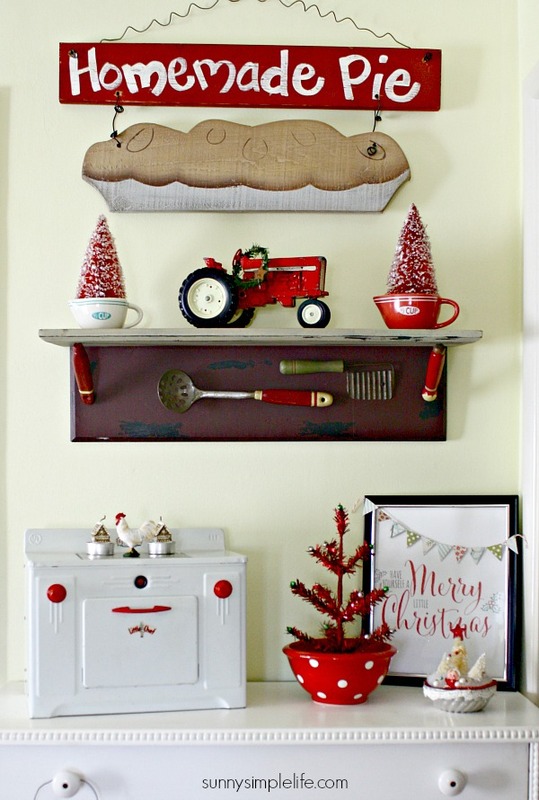 Gifts from friends and our toy vintage stove make for perfect red and white holiday decor. The red vintage toy tractor was hubby's when he was a boy. I love that we still have it and vintage toys make great Christmas decorations. He added a little green Christmas wreath and waa-laa! Of course some red, green and white Christmas decorations slipped onto our vintage shelf but that's okay. Adds just enough pop of Christmas color. 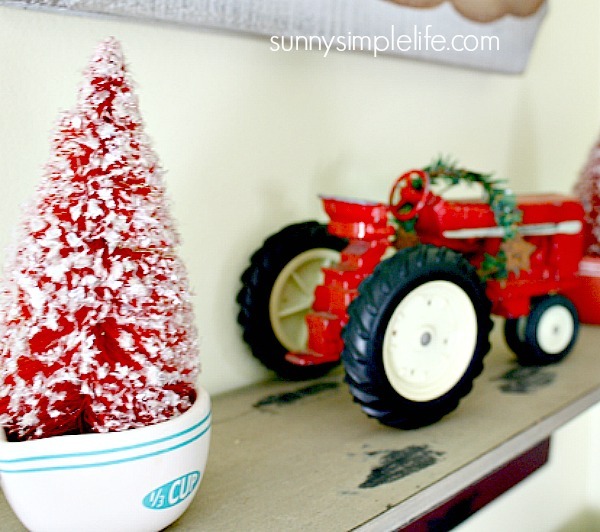 Whenever I search for red and white Christmas decorations Pinterest, I am always finding so much Christmas inspiration and charm. It is truly a favorite color combination and this may be my favorite little Christmas corner this year. Our original 50's kitchen is so fun to decorate. This is the room we go for bright colors in. We have always decorated the kitchen in previous years with lots of red. Next up is our little kitchen shelf all decked out in more vintage toys. Well, you had me at the word RED. I love all your red touches especially the vehicles and bottle brush trees. So fun to see your great decorations. I gave that up years ago when I reached old age. No fun for just one. 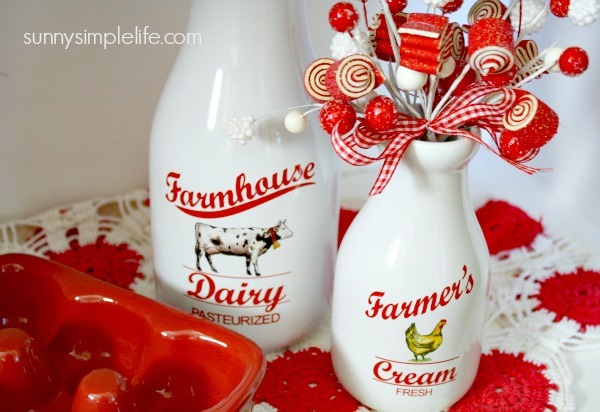 Love your red and white decor! So bright and vintage! Love all of your red touches. I know they just pop with your yellow walls. Darling! LOVE this!! There is nothing like a red Kitchen normally and at Christmas, it looks even better. 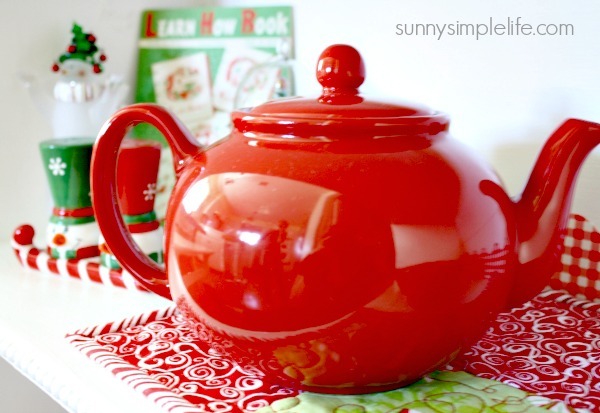 Good Afternoon Elaine, How fabulous, I love red Christmas decorations as well and I love that you decorated your kitchen, with so many beautiful things... especially the ones which have fond memories. I love decorating for Christmas, as it makes me so happy, with each Christmas decoration which I unwrap. I will be decorating my home on Saturday.... and I cannot wait. Thanks for linking up at Blogger Spotlight Link and Pin-It Party. What a pretty bookshelf. 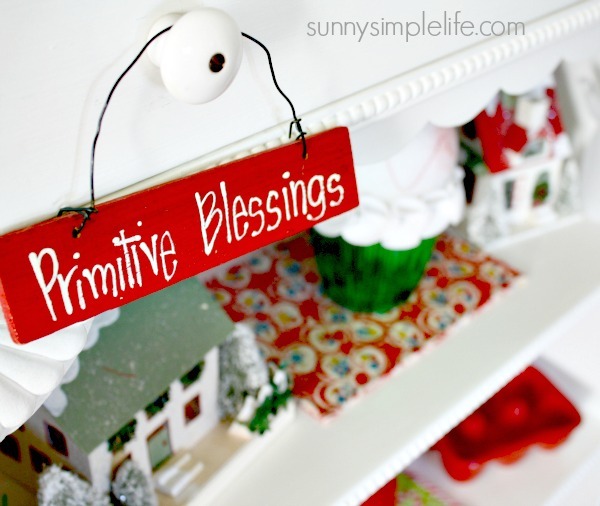 Very cute way to decorate. Oh Wow, I love all your vintage red. The tractor and little stove. Great decorations! Love the vintage decorations and all of the red! Your kitchen looks amazing!